1. Click the chords you know. 2. Get a huge list of songs you can learn right now. I don’t know this chord. Set all chords to this color. 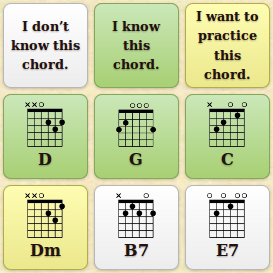 I want to practice this chord. Help me improve the database! Please comment below if you’ve spotted some incorrect chords or if you can suggest more songs to include. Thank you!